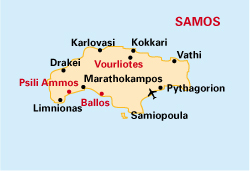 Large and mountainous (up to 4,600ft), Samos slightly resembles Crete – bands of over-development but also vast stretches of virgin mountain with stone villages hidden amongst them, lush hillsides of vineyards growing Samos sec and some glorious sandy beaches. Because it is quite a large island, our clients often stay in two centres. By our standards it is quite popular, but the areas under Martian occupation are easily avoided – and we do. 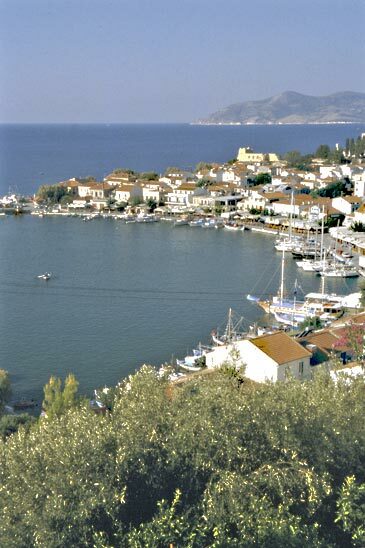 There are three ports – Vathi, the capital, and Karlovasi on the north coast and Pythagorion in the SE; the latter is where you get the hydrofoil to Fourni and, though busy with Martians, has such a lovely harbour-front with tavernas cheek by jowl that you can effortlessly enjoy an enforced wait there. 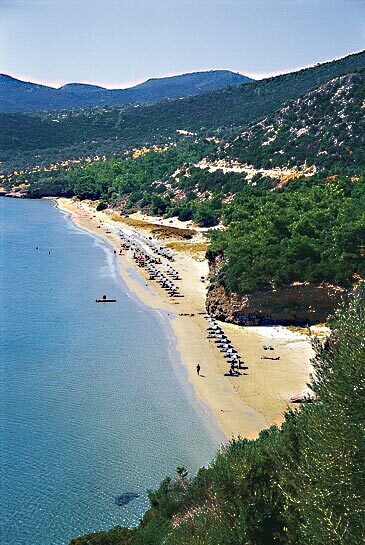 The island is a paradise for walkers and has interesting archaeological remains in the south-east near Pythagorion, not to mention Turkish Ephesus, easily visited on a day trip from Vathi. A network of paths all over the island leads the walker to unspoilt villages or into the mountains behind. Daytime charters run from Gatwick and Manchester on Thursdays; but OA from Heathrow (three daily), Gatwick and Manchester with good onward connections allow total flexibility. Some interesting antiquities to see, mostly near Pythagorion (whose Hypotenuse Square is, of course, equal to the Squares on its other two sides): notable are the tunnel of Evpalinos and the Heraion. 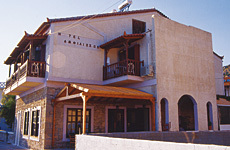 The mountainous interior is famous for its wonderful walking with, by Greek standards, passable signage here and there. 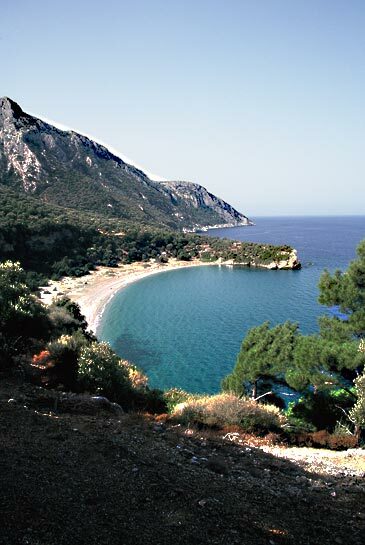 Samos's magnificent, lush mountain scenery and its views to other islands and across to Turkey can be appreciated whether you are on trekking trails or driving on the surprisingly good roads. If you brave the narrower roads you will hit upon gorgeous villages tucked into hillsides everywhere. All with tavernas of course. The uncrowded sandy beaches are superb, but can involve some effort in reaching. 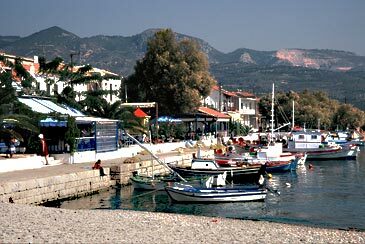 Few, provided you avoid the Martians at Kokkari (but stop for a drink or lunch on the picturesque harbour-front) and some of the east coast between Vathi and Pythagorion. 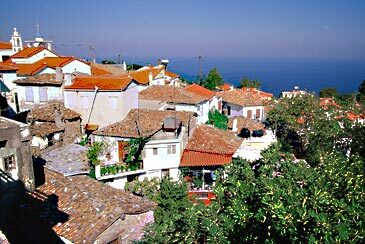 Vourliotes is an enchanting village of crumbling stone houses (including twelve tavernas!) in the north of the island. Its narrow streets ensure it is traffic free and its altitude guarantees fresh mountain air and breath-taking views across to Turkey and Chios. The tiny square is so perfect it feels like a film set. Vourliotes seems like another world, yet in 15 minutes you can drive to Tsamadou or Kampos beaches and in under 30 you can reach Vathi, the capital. Or, turning left at the coast road, proceed west to Karlovasi; from there you can cross quickly to Marathokampos Bay in the south or you can park at the end of the road and walk through the pines to the long sandy beaches of Mikro and Megalo Seitani. is a tiny seaside village on Marathokampos Bay in the south-west. Just beginning to think about tourism, Ballos consists of a promenade, a line of trees backing the shingle and sand beach a few bars and restaurants and a small hotel – ours. 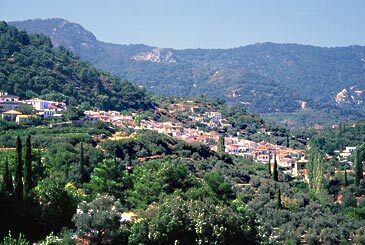 In the steeply rising mountains behind you can find lovely villages with fabulous panoramas out to sea. It is utterly peaceful, yet new roads quickly bring you to neighbouring Ormos Marathokampos for shopping and a stronger dose of Greek life and to stunning sandy beaches beyond. 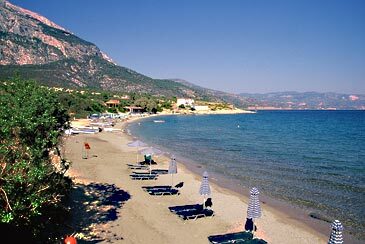 If you drive 6km west from Marathokampos you reach Psili Ammos (be sure you – and above all your taxi driver - don’t confuse this with the other Psili Ammos in the SE of the island well beyond Pythagorion), perhaps the best sandy beach on the island. Overlooking it is a taverna for food and drink and for hiring beach sun-beds and umbrellas – and clients who do so may also use the large pine-shaded pool. 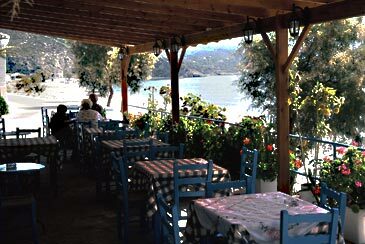 For more tavernas (and some water-sports) continue to Limnionas, which has almost as good a beach as Psili Ammos. This is a perfect base for exploring the dramatic corniche road up the west coast to Drakei or for climbing Mt. Kerketeas. One of the enchanting old villages in the vineyard area and about the same distance vertically as horizontally from the coast, with staggering views across to Turkey. Small beaches nearby; walking on the doorstep. The guest house is simple, but beautifully located for both the view and the proximity of one of the most charming village squares in Greece. Maria grows organic fruit, wine and veg with which she supplements breakfast; she will provide dinner on request. 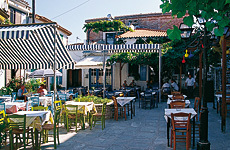 Ballos is a tiny, traditional Greek village reminiscent of 25 years ago and showing signs of an interest in fishing. Gorgeous views to Fourni. 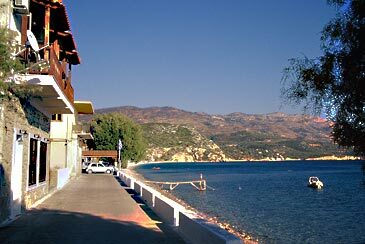 Very quiet (but with several tavernas), but the equally traditional village of Marathokampos is a very short drive away with yet more tavernas overlooking its bustling harbour. The hotel is right on the water-front with a nice terrace for breakfast or a drink. The view from your terrace or balcony across the long sweep of glorious sandy beach to Fourni is gorgeous. You can be on the beach in seconds.